Drinking too much is becoming a big problem in our admissions unit. We used to see alcohol problems occasionally, now we see them a lot. Today we admitted Kevin, age 44. He had been drinking at least a bottle of vodka every day for the past year or more. His friend called the ambulance because Kevin had terrible upper abdominal pains and vomiting. He didn’t want to come into hospital because he knew he would not get his vital vodka, but relented when he realised that he could not drink anything without throwing up. The problem was that he had acute pancreatitis caused by his drinking. 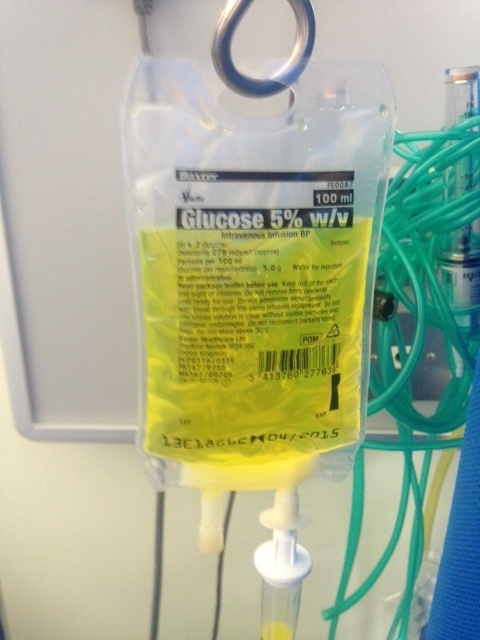 As soon as he arrived in the emergency department an intravenous cannula was put in and he was given Pabrinex, intravenous fluids and morphine. Pabrinex is the trade name for a combination of vitamins, mostly B vitamins, and importantly it contains lots of vitamin B1 or thiamine. It is bright yellow because it contains vitamin B2, also known as riboflavin which is widely used to colour food and drinks such as orange juice (E number 101). If you take too many B vitamin supplements the riboflavin can make your urine a fluorescent bright yellow. But thiamine is the important one. We are really keen to make sure that alcoholics get thiamine as soon as they arrive in hospital. Without it they can suffer permanent brain damage. Kevin is addicted to, and dependent on alcohol. That means he feels very unwell if his blood alcohol levels fall to near zero, so he must keep his intake enough to make sure that does not happen. Alcohol is removed from the body in a different way from most other substances. Usually the rate at which a chemical such as a drug is removed from the body is dependent on the amount of drug present. To put it another way, the rate of elimination depends on the concentration in the blood. 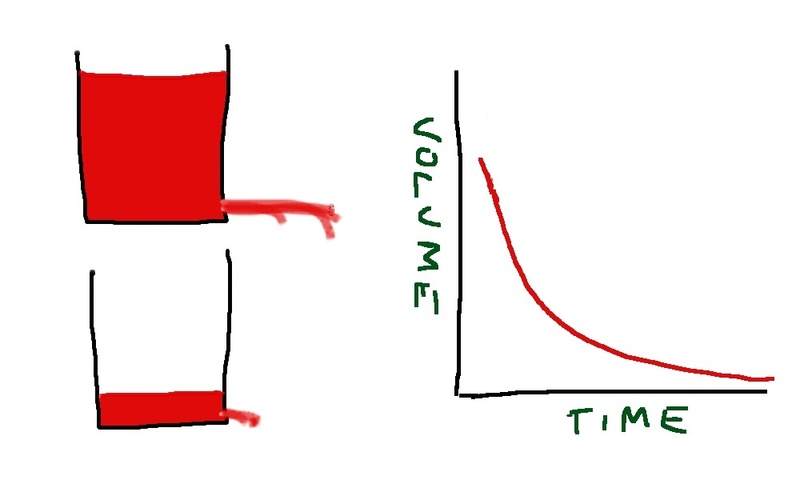 High concentrations mean that every hour a lot is removed, low concentrations much less is removed. The normal way things work with drug elimination is the bucket-with-a-hole-in-the-bottom method. When the bucket is full, water gushes out of the hole quickly, but when nearly empty comes out in a trickle – this is called first order metabolism. But alcohol is not handled in this way – if it was it would be a disaster. 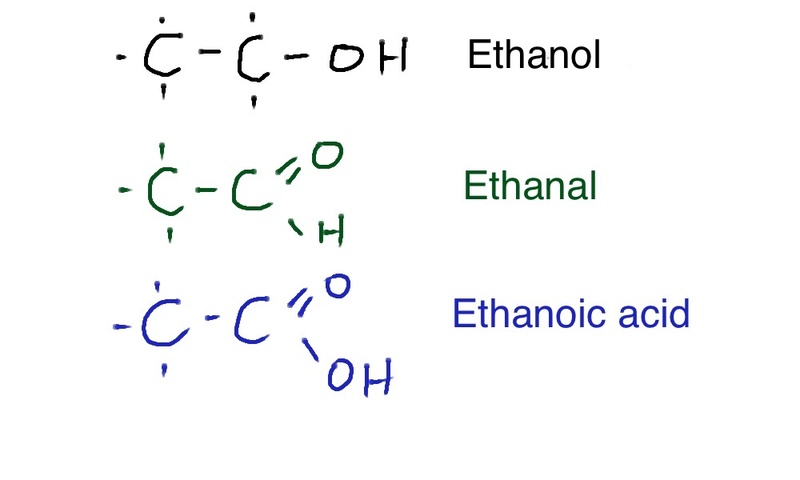 Alcohol, or ethanol to give its proper chemical name is first turned into ethanal (also known as acetaldehyde) and then ethanoic acid (aka acetic acid). Both ethanal and ethanoic acid are pretty toxic. Ethanol is not metabolised by first-order metabolism, but by zero-order metabolism. The bucket analogy now is to think of someone with a ladle who scoops out a measure of water from the bucket every 10 seconds. 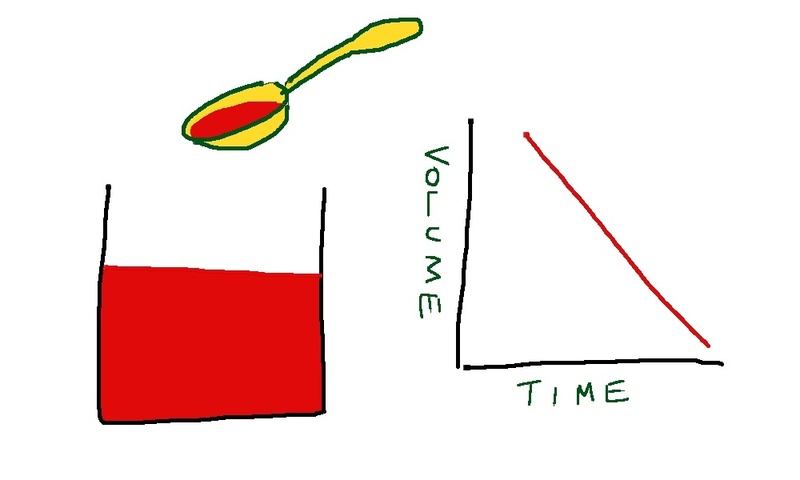 The rate at which the bucket empties now is not dependent on the amount in the bucket, but on the size of the ladle. This is a safe way to metabolise ethanol because it limits the amount of ethanal and ethanoic acid which can accumulate – not enough to do serious damage. Have you ever noticed the guy asleep on the floor at the end of the party who has drunk so much that he can’t get himself home? Next time look at his breathing pattern – he will have slightly rapid, deep, and sighing respiration. This is known as Kussmaul breathing and is due to the large amounts of acetic acid being produced from the alcohol he has inadvisedly drunk. (Although I note that the person who has written the Wikipedia article on Kussmaul’s respiration says that this term only applies to those patients about to die from acidosis – not how it is used in most medical wards – perhaps a bit of a pedant?). If the alcohol was being metabolised by a first-order hole-in-the-bucket process he would not survive. How big is the ladle? – various authorities suggest this is between 10-15 mls of alcohol per hour. If we take the lower figure this equates to 1 unit of alcohol per hour. That means Kevin has to drink 240mls of ethanol every day to keep enough on board to keep his brain happy. Most vodka in the UK is 40% alcohol by volume. So an average 750ml bottle contains 300mls alcohol – that will do nicely! The problem is that this 300mls of alcohol has a lot of calories. 300mls is 240 grammes (the specific gravity of ethanol is about 0.8). Each gramme of alcohol provides about 7Kcal so the bottle of vodka has about 1600Kcal of energy. Given that Kevin drinks his vodka with tonic water, which provides 150Kcal/day, and that his requirement to maintain normal weight is 1800Kcal/day suggests that he does not eat many other calories. He admits this. It reminds me of the Glasgow vegetarian diet – 15 pints of heavy and 2 packets of crisps. The serious point is that if someone is truly dependent on alcohol, they will be seriously malnourished. 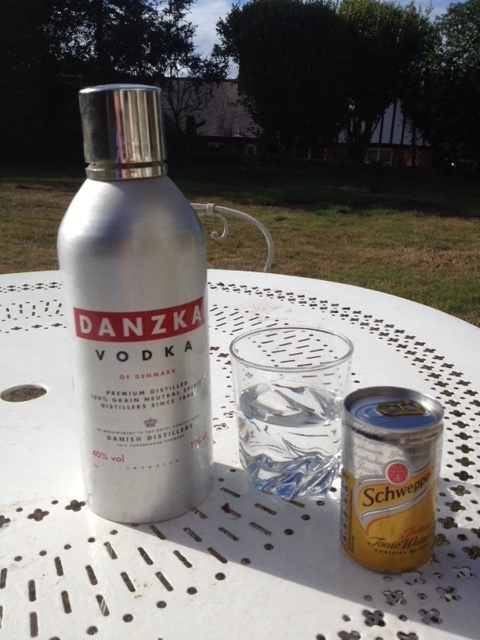 Vodka and tonic is not a balanced diet (no, it really isn’t). There are all sorts of nutritional problems that alcoholics encounter, but one really important one is irreversible brain damage due to thiamine deficiency. What is thiamine, and why does deficiency cause brain damage? 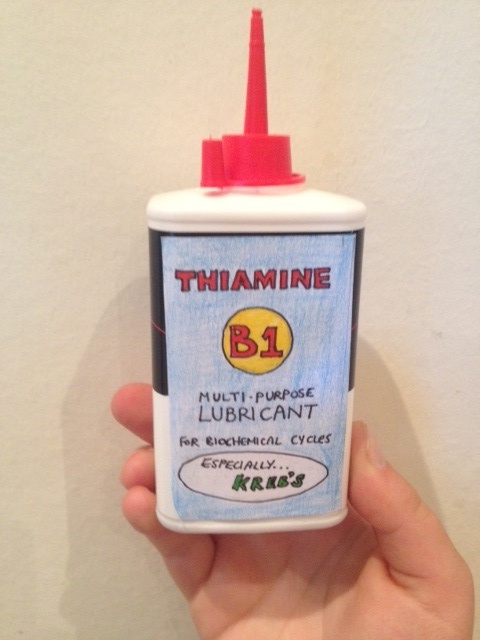 Thiamine is vitamin B1, present in many foods, and if you have a varied diet you will not become thiamine deficient. It is important as a co-factor in a number of enzyme reactions, particularly those of the Kreb’s cycle which produce energy from carbohydrates, protein and fats (and alcohol). The brain and heart use more energy than other organs and are therefore more susceptible to thiamine deficiency, causing cerebral beri-beri (Wernicke’s encephalopathy) and wet beri-beri (congestive heart failure). There is a wonderful, if somewhat disturbing, paper from 1947 by Hugh de Wardener which helped convince the world that thiamine deficiency causes brain damage. He became a medical officer at Changi, when large numbers of British servicemen were only given small amounts of white rice (with weevils) instead of their usual rations. This, combined with dysentery meant that large numbers succumbed to thiamine deficiency. 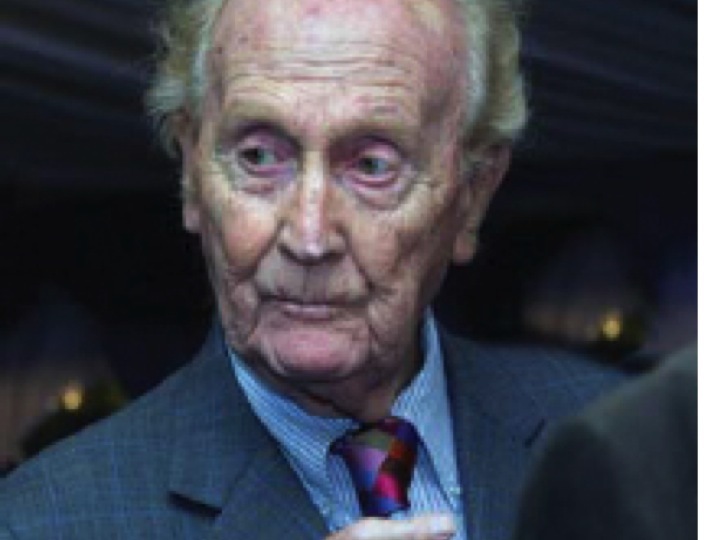 Dr de Wardener realised that this was an unparallelled opportunity to study the effects of thiamine deficiency – not something you could ethically do in humans now. He and his colleagues carefully described the clinical features of soldiers suffering from thiamine deficiency, or beri-beri, and when they died, pickled parts of their brains in the small amount of formalin they had available. The mammilliary bodies are particularly prone to damage by thiamine deficiency. De Wardener, H. E. and Lennox, B. (1947) Cerebral beriberi (Wernicke’s Encephalopathy): review of 52 cases in a Singapore prisoner-of-war hospital. Lancet 1, 11 – 17. I can’t talk about thiamine deficiency and brain damage without mentioning Korsakoff’s psychosis. This is a truly debilitating long-term loss of memory which is vividly described in Oliver Sack’s book “The man who mistook his wife for a hat”. If you have not read this book you need to buy or borrow it, but would warn that you should not plan to do anything important for the following day or two because you will not be able to put it down. Kevin’s pancreas was damaged by too much alcohol, because ethanol is metabolized to ethanal which damages protein – much the same way that formalin (properly known as methanal) was used by Hugh de Wardener to preserve his brain specimens. I regularly eat lamb pancreas. It is sold by my butcher as sweetbreads. Salivary glands, thymus and testicles are also called sweetbreads and taste very much the same as pancreas, and they all look quite similar when viewed under the microscope. Perhaps its not surprising that the three glands which are attacked by the mumps virus are salivary glands, pancreas and testicles. Mumps virus likes them all raw. 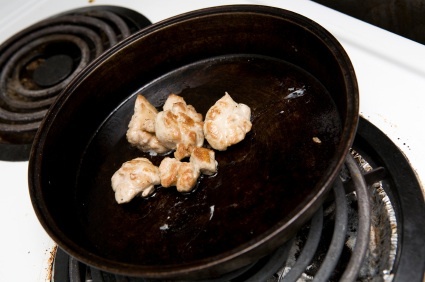 I’ve never tried testicles but I like pancreas gently fried in butter on toast with a dribble of balsamic vinegar. Just been reading your blog from Bulgaria! I’ve enjoyed it – conversational style nice and good to see some chemistry, but you really do need to get chemdraw (or the inferior but free accelrys draw) for the structures. I’m not sure about going straight from talking about your patient’s pancreas to how much you like eating pancreas, but I’m sure you’ll just tell me I’m squeamish. Can you have a home page where all the entries are visible and clickable on? Another really interesting read! That’s the whole point, Soof, it’s food and medicine – get with the programme! You’re in Bulgaria?! I’ve enjoyed what I’ve read so far! Just covered respiratory and metabolic alkalosis/acidosis and compensation mechanisms in clinical biochem. Our body came up with a clever system to stay in such a tight pH range! I would feel guilty about eating the pancreas, but being vegan saves me. Isn’t it interesting that we so often invent a new name when we eat body parts (‘sweetbreads’) or animals (‘pork’, ‘beef’). Medical student reading the blog at your recommendation (and very much enjoying it)! I just wanted to let you know that your ABC link regarding Changi is no longer working. The one above to the History Learning Site does though.